We are back to using the Phonics Road each day. We began the curriculum last year but came to a standstill with it. We have started over at the beginning and are now making great progress. Curly was not ready to move forward in Level 1 until now. I really enjoy using this curriculum and find it easy to teach and the rules are memorable for Curly. We are going to keep pressing forward this year. We begin our time by introducing our new words for that day. I spell the words out on the white board while Curly writes them in her notebook. We mark each word as we go and sing the rule tunes. If there is a building code page to complete (a page which outlines one of the spelling rules) then we work on that page. I write on the board while Curly writes in her notebook. If there is not a building code to complete that day, I pick one topic for review. We review a spelling rule or a grammar rule that I choose. I write the rule on the board and we think of examples of that rule. I then test Curly on a few words from previous weeks. She writes these words on a paper, on her own whiteboard, or spells them using the letter tiles from All About Spelling. At the end of some lessons, I give her a sentence or two of dictation. I make up the sentences using spelling words from previous weeks. Sometimes we review a few of the phonograms and think of words that use those phonograms. Our spelling/grammar lessons usually only take 20-30 minutes each day. Curly is remembering the spelling words well and is applying to spelling rules to new words that she has not yet learned. I have been so pleased with how well she is doing. In a few weeks we begin Weeks 13 and 14 which will introduce some new phonograms and writing capital letters. After that, the curriculum adds in the readers. Since Curly can already read fairly well, we will probably use the readers to reinforce grammar and might use the sentences as dictation exercises. 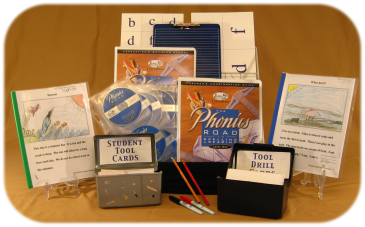 To prepare for Phonics Road I watch several lessons worth of the DVD’s ahead of time. I usually watch them in fast forward mode so poor Barbara Beers sounds like a chipmunk. The key to watching the videos is to take detailed notes so you can refer back to them when you teach. There is a wealth of information contained on the DVD’s, and I forget more than half by the time I try to teach it to Curly. My detailed notes have been so very helpful and will be valuable when Tiger starts the Phonics Road in a few years. I can’t wait until we are past Week 15 and are into the more meatier portion of the program in which grammar is introduced. The first 14 weeks are lots of phonograms and lots of spelling words. It can be tedious. But our hard work is paying off! thanks for stopping by! We are heading into a the classical realm at first grade…I'll be watching your blog 😀 I'm a new follower! I haven't heard of this program:) But there are so many out there:). Glad it is working out for you.